David Armstrong, Deputy Chief Executive? The Chair, Cllr Ann McLachlan (Labour) apologised for starting the meeting late. The Chair, Cllr Ann McLachlan Labour asked for any declarations of interest. None of the six councillors (including the Chair, Cllr McLachlan Labour) made any declarations of interest. The minutes of the Investigation & Disciplinary Committee on the 20th August 2012 had been published on Wirral Council’s website. The Chair, Cllr Ann McLachlan asked if the minutes were agreed? Cllr Lesley Rennie disputed the minutes and stated they were missing that she had said at the last meeting that she wanted it minuted that she wanted Richard Penn to be invited to the meeting. She pointed out that this was missing from the minutes. 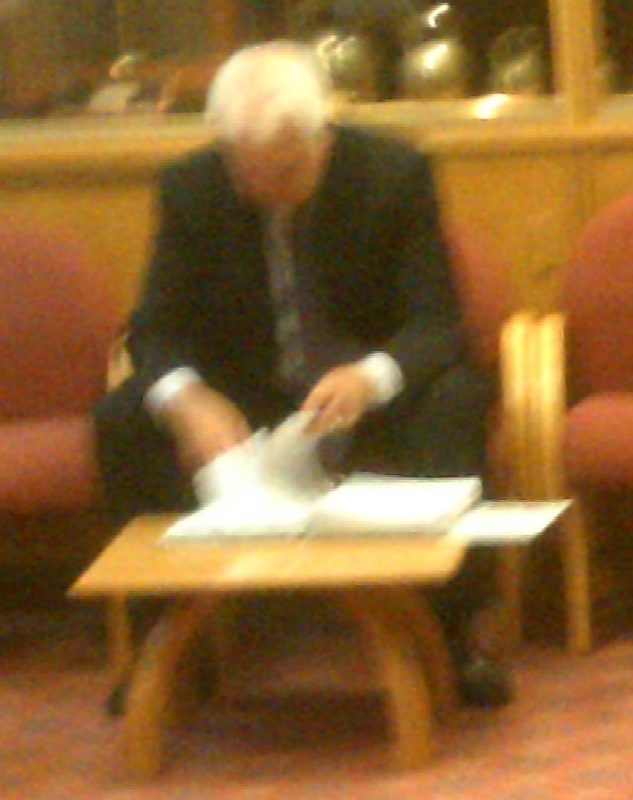 The Chair, Cllr Ann McLachlan said it was fine as Mr. Penn was “in the building” [see above photo of Richard Penn waiting in lobby, Ground Floor, during agenda item 4 (not the room the meeting was being held in)]. She thanked Cllr Lesley Rennie for pointing this out. There were no more comments on the minutes of the meeting held on the 20th August 2012, so the Chair moved the meeting onto agenda item 3. The Chair expressed her opinion that the press and public should be excluded from the meeting for agenda item 4. She expected the two members of the public to leave, however a member of the public waited for the Committee to agree with this opinion. The reason she gave was that it related to “staff”. The two members of the public left. The Committee received the reports from Chris Hyams (Proper Officer), Tony Williams (Acting Employee Relations Manager) and Richard Penn (Independent Investigator). Only Chris Hyams and Tony Williams were present at the start of this item. The reports were about the suspensions of Bill Norman, Ian Coleman and David Taylor-Smith, following the decision made at the Investigation and Disciplinary Committee meeting of the 20th August 2012 (agenda item 4). Outcome: request made to Employment and Appointments Committee (3/10/2012) for Early Voluntary Retirement (£82,528.50) effective from 5th October 2012. Compromise Contract (£155,416) (agreed by Employment and Appointments Subcommittee (Compromise Contracts) of 20th September 2012. Made redundant as of 30th September 2012.